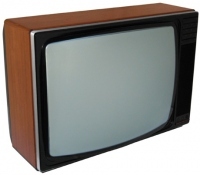 The arrival of the 20AX tube system from Philips changed the design of television sets from all the quality European manufacturers, and B&O were no exception. The arrival of the 35XX models finally saw B&O break away from the complex designs of the past years, the new chassis was neat, well laid out, cool running and very reliable in service. Text copyright © Beocentral. Unauthorised reproduction prohibited. As well as the new 20AX in-line tube, the new sets included another Philips innovation, the diode split line output transformer. This new technology did away with the need for a separate tripler or rectifier valve, and great reliability was promised, backed by millions of device hours in testing without a single failure. So successful was this technique that it would be used in modified form in all subsequent Beovision models. The use of the 20AX tube system helped greatly to simplify the design, with its modest convergence correction requirements and reduced power consumption. The need for much less scanning power in particular allowed the vertical scan generator to be based around an integrated circuit, another great step forward. Text copyright © Beocentral. Unauthorised reproduction prohibited. A feature that did remain from previous models was the automatic colour truth circuit, which kept the tube in correct adjustment for long periods of use without the need for re-balancing. Combined with the simplified convergence section (now called “tube tolerance adjustment”), this meant that these models could run for many years without the need for adjustment to correct any deterioration in picture quality. The sound section had not been ignored either, and all models included a cabinet type loudspeaker and a quality amplifier with treble and bass controls. Text copyright © Beocentral. Unauthorised reproduction prohibited. Models such as the Beovision 3802, 4402 and 6002 included an excellent ultrasonic remote control system with a new terminal called the Beovision Control Module. This gave control over 16 functions (8 programme selections, volume, brightness and colour levels, reset and standby) an because it used a matrix system based on combining a high and low frequency, it was not subject to spurious operation, unlike some rival makers’ offerings! Later on, a Teletext decoder became available as an optional extra, a first for B&O. This included the decoder panels for fitting in the set and a new terminal with the Teletext functions included on it. There were also basic push button sets in the range, such as the Beovision 4002. They were distinguishable only by the absence of the ultrasonic transducer for the remote control and that the control keys for the programmes were marked in white instead of orange. Text copyright © Beocentral. Unauthorised reproduction prohibited. One thing that marred an otherwise excellent set was the power supply. It was based on a full-wave controlled rectifier, and the choke used in the B&O design was of a type that proved mechanically noisy in service. The low buzzing noise of this was very noticeable during quiet parts of the programme! Some were worse than others, and replacement was sometimes required in really severe cases. Text copyright © Beocentral. Unauthorised reproduction prohibited. It is strange that a set which was designed as a result of new tube technology should be made obsolete by a further advance in that field, but that’s what happened to these models. The new Philips 30AX self-converging tubes appeared in 1980 and formed the basis for the new 33XX series Beovisions. Text copyright © Beocentral. Unauthorised reproduction prohibited.